This very nice piece for two flutes and piano was kindly contributed to our collection by Spanish composer Pablo Toribio. The “Dance of the Villain” is part of a set of compositions for two flutes and piano titled La Princesa de la Media Luna (“The Princess of the Half Moon”). Since these compositions are based on a medieval legend that takes place in the so-called Montes Torozos (Valladolid, Spain), old Hispanic harmonies have been used. 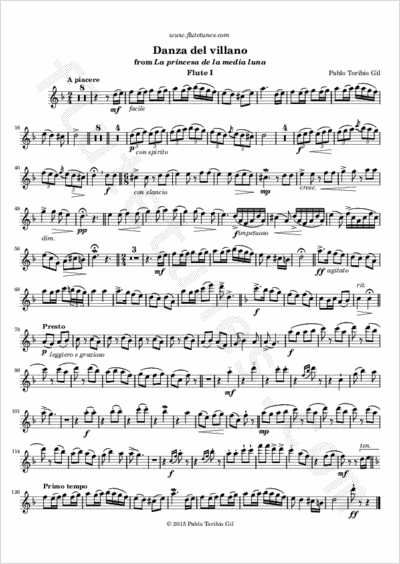 In the first part of this piece (tempo a piacere) the harmonic scheme known as “La Folia” (I-V-I-VII-III-VII-I-V) is used, which was an old compositional resource used in Spain. The second part (presto tempo) constitutes a musical metaphor of a kind of paloteo, a dance with sticks very common in the villages located in Montes Torozos. The clicking of sticks is symbolized by a rhythmic-imitative game played by the flutes. We suggest that, at this point, the flutes do not remain too close together to create a “stereo” effect.